Homemade Poppycock, that is :0) … Chex Mix-style. I LOVE Chex Mix and enjoy making for all to enjoy on every occasion- parties, birthdays, wine tours, boating, road trips, etc. The last time I made it was just a few weeks ago (will post a recipe next time I make a special batch) and Maggie last week made her version of a Snicker-doodle Chex Mix so I have had a ton of leftover “supplies” in my pantry. Let the mix cool on the backing sheets but make sure to stir! I typically go for the spicy, garlicky, oniony, cheesy Chex Mix, but I wanted something a bit sweeter this time (surprising, huh?). 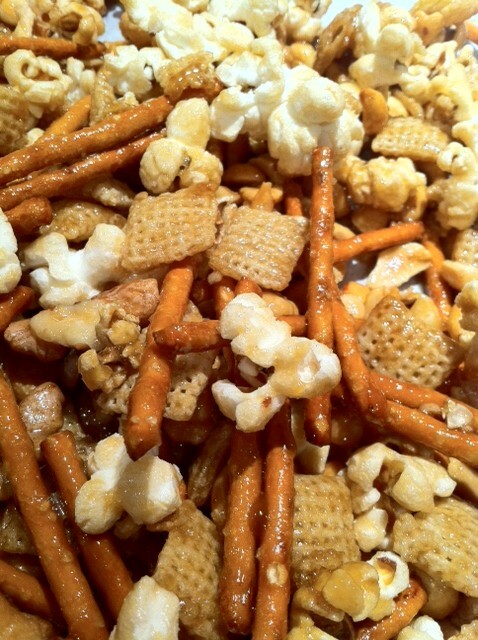 So using the ingredients I would normally use for the savory mixes, I put together a buttery carmel mix that turned out to be a perfect Cracker Jack, Poppycock & Fiddle Faddle combination! In a small to medium saucepan combine the corn syrup, butter and brown sugar on low heat and stir occasionally. DO NOT BOIL! LOW HEAT!! While everything is melting together in the saucepan, combine all your goodies- peanuts, walnuts/pecans/almonds, corn/rice Chex Mix, pretzels and popcorn in an extra large mixing bowl. Stir the butter/syrup mixture well and then pour it over the goodies. Carefully stir and evenly coat them…then place on your baking sheets. 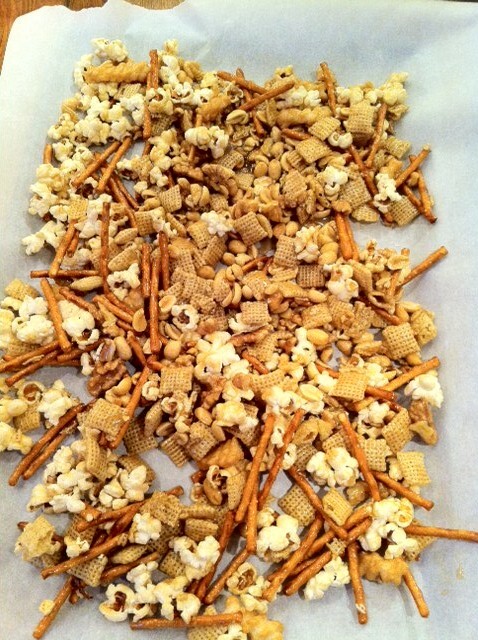 Store in an airtight container and you have the most addicting homemade Cracker Jack/Poppycock/Fiddle Faddle snack EVER!